Interim project results were presented at the international workshop Saltsjöbaden VI in Gothenburg, Sweden, on March 19-21, 2018. New project "GAINS and EMEP modelling in the Russian Federation: furhter developments at the regional level"
The project "GAINS and EMEP modelling in the Russian Federation: further developments at the regional level" started in March 2015. The Task Force on Integrated Assessment Modelling held its 42nd meeting in Copenhagen, Denmark, on April 22-23rd, 2013. More information is available here . On the 16th of April a project completion seminar was held at the Ministry of Natural Resources and Environment of the Russian Federation, where the results of five years of cooperation was presented and discussed. The representatives from the Ministry expressed appreciation of the results and the successful cooperation. At the seminar ideas and proposals for further Russian – Swedish bilateral cooperation on air pollution related issues were also discussed. Here is the press release from the meeting (in Russian).Presentations from the meeting can be found here. 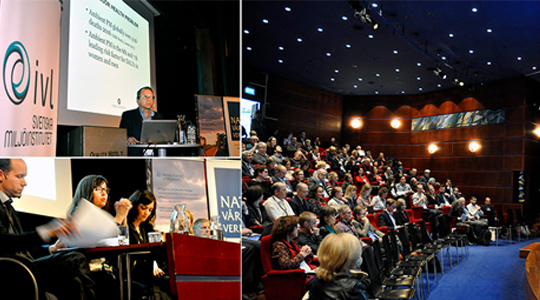 The next TFIAM meeting is planned to be held in Copenhagen on the 22-23rd of April 2013. This cooperation project has together with IIASA and met.no been able to update a previous version of the GAINS Russia model. The model is available for registered users here . During this cooperation project we have developed a guidance document aimed at local and regional authorities as support for estimating the critical load for acidification in the regions of the Russian Federation. The guidance document can be found here (pdf, 790.3 kB). Project seminar back to back with the International Air Congress “Atmosphere — 2012"
A seminar focused on improving air quality in Eastern Europe, Caucasus and Central Asia and prospective implementation of the GAINS model in the Russian Federation was held back to back with the International Air Congress “Atmosphere — 2012" in St Petersburg on April 17 2012. Project working group met in St. Petersburg, Russian Federation, 17 November 2011, to discuss practical and administrative issues concerning further implementation of the project plan. The bilateral research project "Development of the Co-operation within the Convention on Long-range Transboundary Air Pollution — CLRTAP" has been running since 2008. As the project goes more and more public we launch our new website RUSACO (RUssian Swedish Air COoperation) with info about air pollution, the latest developments in the international arena as well as within the project.